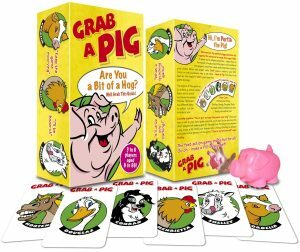 Grab a Pig is a British card game that was invented to be flexible; it’s flexibility in turn makes it suitable for adults as well as children. The idea for Grab a Pig came about in the christmas of 2000 over one or two glasses of wine; however just because we like to play Grab a Pig with a glass of wine does not mean we would recommend that you do. We have customers from most adult age groups who are enjoying Grab a Pig as an adult game or drinking game. It is great for getting the party started “a great ice breaker” as one of our customers states in their testimonial. Grab a Pig is a multi award winning card game which received the Silver award from the Good Toy Guide; also on more than one occasion they awarded it Highly Recommended. Often when people first look at the high quality child friendly graphics of Grab a Pig they think of it only as a family game; but trust me, play it and you will soon see that underneath the cute animal graphics and family fun rules beats the heart of an adult game waiting to get out. It’s flexibility is one of the strong points of the Grab a Pig card game. By day it can be a family game enjoyed with your children; however, by night when the kids are in bed you can play it as a raucous drinking game. Grab a Pig gives you three lives before you are out. This means that when you lose a life you can take a drink, do a forfeit, perform a dare or anything else; this makes it perfect for groups of open minded adults. We guarantee you will have fun once you enter into the spirit of the game. If you want a game for an adult party, to take to friends or maybe even a day in the pub beer garden, then you are bound to enjoy Grab a Pig as a drinking game or as an adult game. Grab a Pig is one game that you will enjoy for years and play for hours. Read some of the testimonials below that relate to Grab a Pig being played as a game for adults. We want the Grab a Pig card game to be one of the great adult party games or drinking games that people will reach for before they go on holidays with their mates or have a party with friends. The Grab a Pig card game is great for groups of men, women or mixed groups for parties, weekends away, holidays and so much more.